13.2.1918: Launched by Cochrane & Sons Ltd, Selby (Yd.No.841) (“Mersey” class) for The Admiralty as JOHN JEFFERSON (Ad.No.3834). 18.4.1918: Completed as an armed trawler (1-12pdr, 1-3.5” A/S Howitzer, Hydrophone and W/T). 03.02.1920: Registered by The Admiralty at London (Part I & IV) as JOHN JEFFERSON O.N.144277 (LO302). By 18.06.1920: Allocated to Ministry of Agriculture & Fisheries, London and engaged in commercial trawling. 04.1921: Paid off. Laid up. 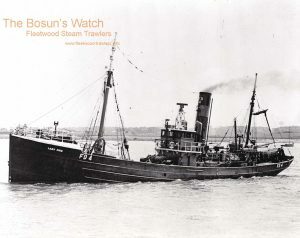 09.1921: At John I. Thornycroft & Co Ltd, Woolston fitted out for fishing under Special Survey of Lloyd’s Register and classed 100A1 Stm Trawler at Southampton. 9.1922: Sold to Thomas Hamling & Co Ltd, Hull. 18.10.1922: Registered at Hull as St. AMANT (H702). Harold Hall, Hessle appointed manager. 3.1926: Arrested at Iceland for illegal fishing. 10.10.1935: Sailed Hull for White Sea grounds on last trip before sale (Sk. Wardle). 4.11.1935: At Hull landed 929 kits grossed £558. 5.11.1935: Sold to Trident Steam Fishing Co Ltd, Hull (George A. Ledger, manager). 9.11.1935: Sailed Hull for Faroe grounds on first trip for new owners (Sk. S. Blackshaw). 23.11.1935: At Hull landed 209 kits grossed £282. 12.12.1935: Registered at Hull as LYNESS (H702). 30.12.1938: Sold to Jutland Amalgamated Trawlers Ltd, Hull (Edward Cargill, manager). 24.4.1939: Registered at Hull as LADY ENID (H702). 26.8.1939: Requisitioned for war service on examination service and as a minesweeper (P.No.FY.547) (Hire rate £96.18.0d/month). 6.1941: Based Portland with M/S Group 49 (Ch Sk. R. Masson RNR). 13.8.1942: Sold to The City Steam Fishing Co Ltd, Hull (J. Marr & Son Ltd, managers). 11.12.1945: Reclassed at Manchester and returned to owner. 21.12.1945: Sold to Henderson’s Trawling Co Ltd, Hull (J. Marr & Son Ltd, managers). 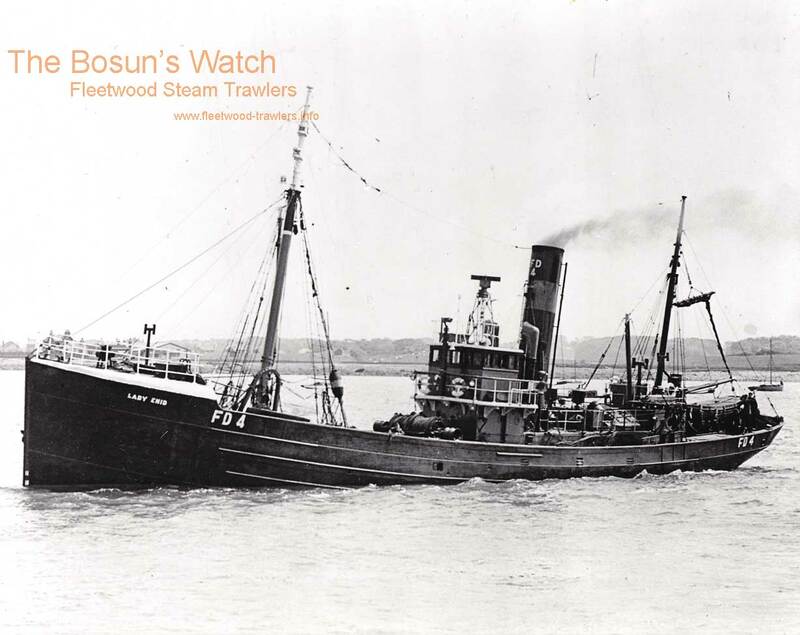 7.2.1949: Sold to Dinas Steam Trawling Co Ltd, Fleetwood (David Marr, manager). 21.2.1949: Hull registry closed. Registered at Fleetwood (FD4). 4.5.1954: Sold to J. Marr & Son Ltd, Fleetwood for £7000. 19.5.1954: Last landing at Fleetwood (West of Scotland – 289 boxes, grossed £1,767). 1.6.1954: Sold to BISCO for breaking up and allocated to Rees Shipbreaking Co Ltd, Llanelli. 6.6.1954: Sailed Fleetwood for Llanelli. This entry was posted in Steam Trawlers, Steamers (Picture) and tagged Dinas, Marr, Mersey Class on January 28, 2009 by Fred Smith.